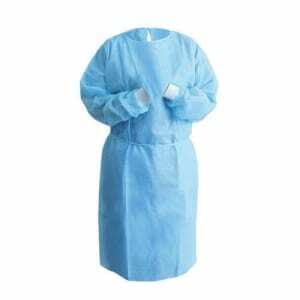 Many invasive procedures are involved in the medical industry and these gowns provide major protection during such procedures. Not just in medical procedures but they are used in a large number of research establishments as well as several manufacturing industries. There are so many chemical products and solutions involved in many scientific procedures and while performing these procedures there is a high chance that the chemical solution may come in contact with your skin and cause allergies or a bad reaction. These gowns are used to provide protection in such scenarios. The gown manufactured by PlastCare features a knit cuff which makes sure that the gown does not slip on your hand and stays intact during a procedure. They are also latex free and fluid resistant so that none of the chemicals or solutions gets absorbed by it and comes in contact with the skin. These gowns are made with non-woven material and are very soft and smooth to touch. There are two colors of gowns manufactured by PlastCare USA: blue disposable isolation gowns and yellow disposable isolation gowns. Worn by dentists, lab technicians, and other health care providers, these disposable isolation gowns provide much needed protection against splashes of fluids, chemical products and solutions and other contaminants, preventing skin irritations, chemical burns, or the flare up of skin allergies and as well as damage to personal clothing. PlastCare USA disposable isolation gowns are 100% latex free and are made with soft, smooth to the touch, non-woven, fluid resistant SMS material and provide maximum protection and extra coverage with a behind the back tie closure. These long sleeved disposable gowns feature a soft jersey knit cuff which prevents fluids from traveling upwards into sleeves during procedures.